USAF-X-15. The X-15-3 56-6672 research aircraft is secured by ground crew after landing on Rogers Dry Lakebed. 1960. NASA pilot Neil Armstrong is seen here in the cockpit of the X-15 ship #1 (56-6670) after a research flight. 1965. Above- The X-15 (56-6670), seen here on the lakebed at Edwards Air Force Base, Edwards, California, was still equipped with two XLR-11 engines pending installation of the XLR-99 engine, which first flew on November 15, 1960, in X-15 #2. The X-15 was a rocket-powered aircraft 50 ft long with a wingspan of 22 ft.
Who was Dr. Harrison Storms? 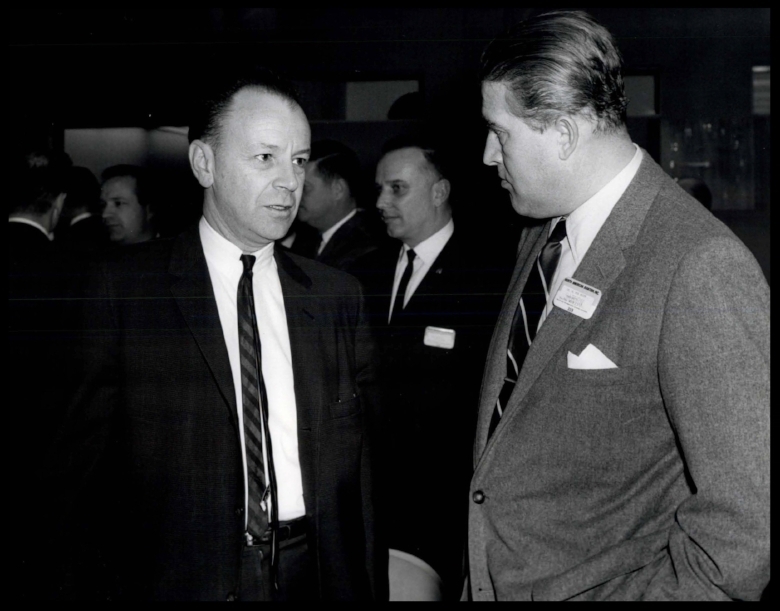 Dr. Harrison Storms and Dr. Wernher Von Braun in Downey at North American Aviation Space Division. Harrison A. Storms, Jr., (1915-1992) helped design Apollo spacecraft and many other aerospace vehicles. A former executive of Rockwell International and its predecessor company, North American Aviation, Storms made contributions to over 40 aircraft and space vehicles. Storms received his bachelor and masters degrees in mechanical engineering from Northwestern University, and an aeronautical engineering degree from the California Institute of Technology. Storms was then employed as an aeronautical researcher at North American Aviation in 1941 and during World War II contributed to the advancement of jet propulsion technology. After World War II, Storms served as Chief Engineer of the X-15 program, and also helped design the F-51 Mustang, F-86 Sabre Jet, F-100 Super Sabre and the XB-70. Storms went on to become the President of North American's Space and Information Systems Division which won contracts for both the Saturn second stage launch vehicle and the Apollo command and service modules for the successful lunar landing program. Storms was the recipient of many honors and awards and a member of several professional organizations, including the American Institute of Aeronautics and Astronautics. Above- The X-15 flight crew, left to right: Air Force Captain Joseph H. Engle, Air Force Major Robert A. Rushworth, NASA pilot John B. "Jack" McKay, Air Force Major William J. "Pete" Knight, NASA pilot Milton O. Thompson, and NASA pilot Bill Dana. 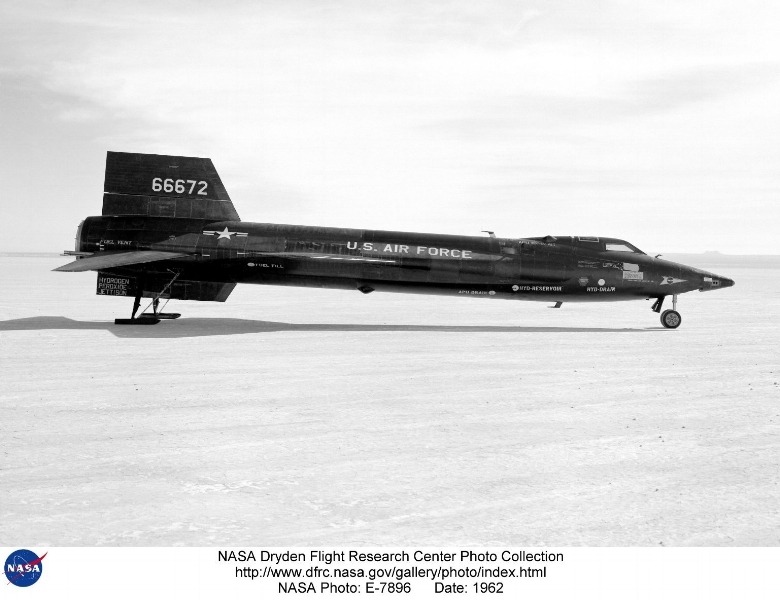 First flown in 1959 from the NASA High Speed Flight Station (later renamed the Dryden Flight Research Center), the rocket-powered X-15 was developed to provide data on aerodynamics, structures, flight controls and the physiological aspects of high speed, high altitude flight. Three were built by North American Aviation for NASA and the U.S. Air Force. They made a total of 199 flights during a highly successful research program lasting almost ten years. The X-15's main rocket engine provided thrust for the first 80 to 120 seconds of a 10 to 11 minute flight; the aircraft then glided to a 200 mph landing. The X-15 reached altitudes of 354,200 feet (67.08 miles) and a speed of 4,520 mph (Mach 6.7). 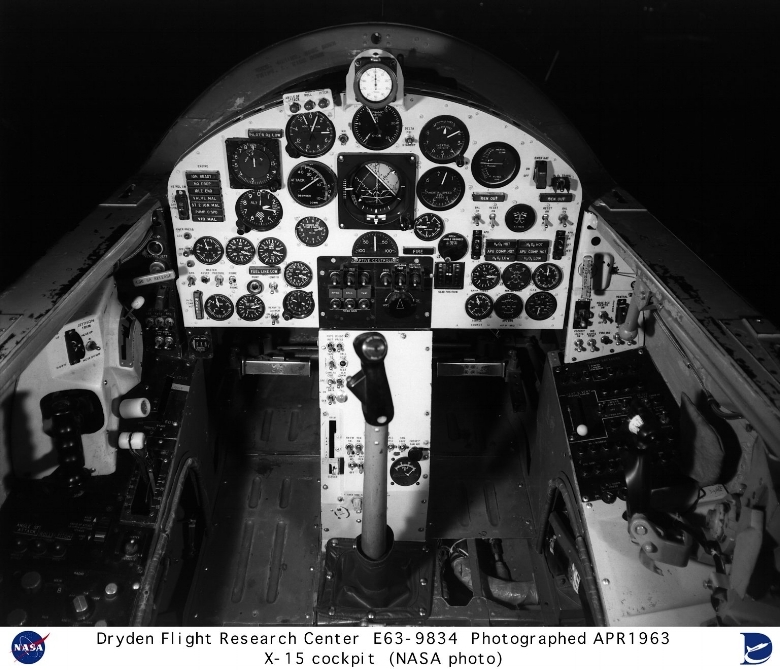 Above- "This photo shows the X-15 cockpit. The X-15 was unique for many reasons, including the fact that it had two types of controls for the pilot. For flight in the dense air of the usable atmosphere, the X-15 used conventional aerodynamic controls such as rudder surfaces on the vertical stabilizers to control yaw and movable horizontal stabilizers to control pitch when moving in synchronization or roll when moved differentially. For flight in the thin air outside of the appreciable Earth's atmosphere, the X-15 used a reaction control system. Hydrogen peroxide thrust rockets located on the nose of the aircraft provided pitch and yaw control. Those on the wing provided roll control. The conventional aerodynamic controls used a stick, located in the middle of the floor, and pedals. The reaction control system used a side arm controller, seen in this photo on the left. The X-15 was a rocket-powered aircraft 50 ft long with a wingspan of 22 ft. It was a missile-shaped vehicle with an unusual wedge-shaped vertical tail, thin stubby wings, and unique side fairings that extended along the side of the fuselage. The X-15 weighed about 14,000 lb empty and approximately 34,000 lb at launch. The XLR-99 rocket engine, manufactured by Thiokol Chemical Corp., was pilot controlled and was capable of developing 57,000 lb of thrust. Above- The X-15 made 199 flights between June 1959 and October 1968. Until the maiden flight of the Space Shuttle Columbia in 1981, the X-15 held the world altitude and speed records for winged aircraft. Photograph and caption published in Winds of Change, 75th Anniversary NASA publication (page 69), by James Schultz. North American Aviation built three X-15 aircraft for the program. The X-15 research aircraft was developed to provide in-flight information and data on aerodynamics, structures, flight controls, and the physiological aspects of high-speed, high-altitude flight. A follow-on program used the aircraft as a testbed to carry various scientific experiments beyond the Earth's atmosphere on a repeated basis. Because of the large fuel consumption, the X-15 was air launched from a B-52 aircraft at 45,000 ft and a speed of about 500 mph. Depending on the mission, the rocket engine provided thrust for the first 80 to 120 sec of flight. The remainder of the normal 10 to 11 min. flight was powerless and ended with a 200-mph glide landing. 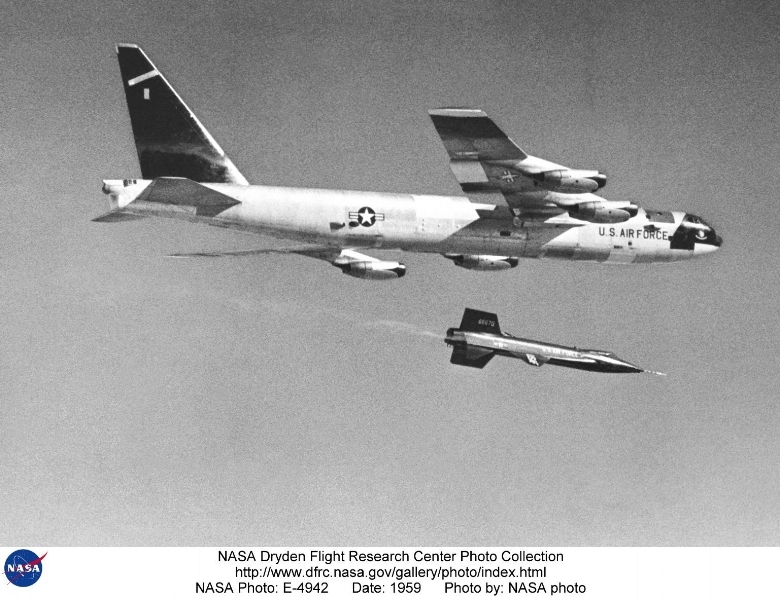 Above- This photo illustrates how the X-15 rocket-powered aircraft was taken aloft under the wing of a B-52. Because of the large fuel consumption, the X-15 was air launched from a B-52 aircraft at 45,000 ft and a speed of about 500 mph. This was one of the early powered flights using a pair of XLR-11 engines (until the XLR-99 became available). Generally, one of two types of X-15 flight profiles was used; a high-altitude flight plan that called for the pilot to maintain a steep rate of climb, or a speed profile that called for the pilot to push over and maintain a level altitude. The X-15 was flown over a period of nearly 10 years -- June 1959 to Oct. 1968 -- and set the world's unofficial speed and altitude records of 4,520 mph (Mach 6.7) and 354,200 ft in a program to investigate all aspects of manned hypersonic flight. Information gained from the highly successful X-15 program contributed to the development of the Mercury, Gemini, and Apollo manned spaceflight programs, and also the Space Shuttle program. The X-15s made a total of 199 flights, and were manufactured by North American Aviation. X-15-1, serial number 56-6670, is now located at the National Air and Space museum, Washington DC. North American X-15A-2, serial number 56-6671, is at the United States Air Force Museum, Wright-Patterson AFB, Ohio. The X-15-3, serial number 56-6672, crashed on 15 November 1967, resulting in the death of Maj. Michael J. Adams." The X-15 ship #3 (56-6672) is seen here on the lakebed at the Edwards Air Force Base, Edwards, California. Ship #3 made 65 flights during the program, attaining a top speed of Mach 5.65 and a maximum altitude of 354,200 feet. Only 10 of the 12 X-15 pilots flew Ship #3, and only eight of them earned their astronaut wings during the program. Robert White, Joseph Walker, Robert Rushworth, John "Jack" McKay, Joseph Engle, William "Pete" Knight, William Dana, and Michael Adams all earned their astronaut wings in Ship #3. Neil Armstrong and Milton Thompson also flew Ship #3. Above- X-15 aircraft mated to launch plane, 1959. NASA-Glenn Research Center Image.